During a project managing the marketing of Care and Support West, Cherry Marketing recognised the need for a website refresh for the company. The existing website's design was great, but the functionality did not meet the fast-moving, and accessibility requirements of the board and team. With the Squarespace platform already developed, it was a simple task of transferring over content from the existing site to the new. With Squarespace's slick design and modern fonts it helped give the website a lick of paint, and an opportunity to rework the navigation slightly to make the whole website more user-friendly. Some opportunities presented themselves during development, such as the possibility to offer care home members and partners their own pages to promote their services using the dynamic page platform. A huge task was to restructure the blog and make the archive and recent material more accessible. 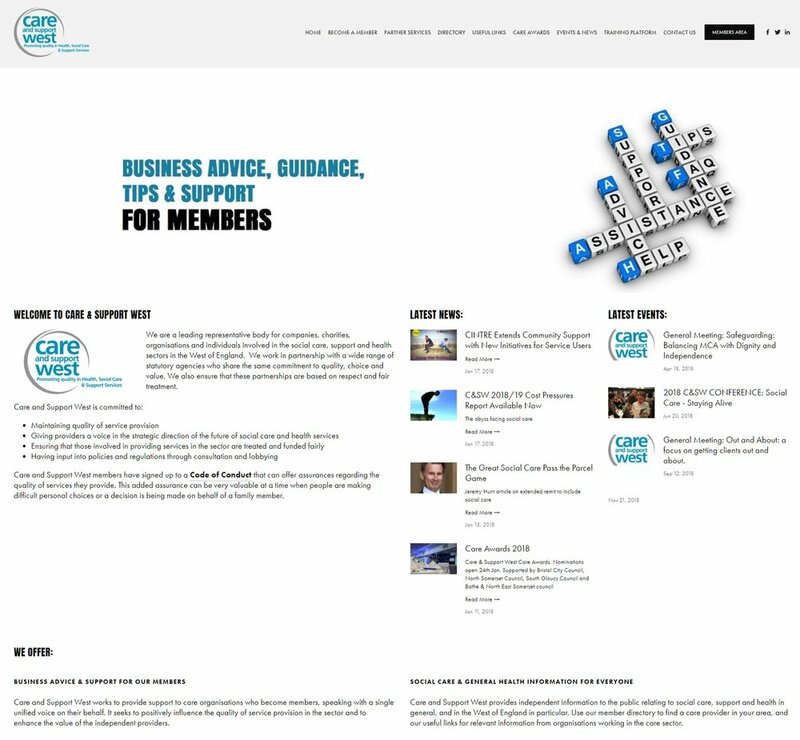 As we were developing this in unison with the Awards organisation, we were able to create new pages to help promote and communicate awards info, such as linking downloadable leaflets to distribute in care homes, adding the information about the speakers, nominees and categories, and adding timely information such as the directions to the venue. Once the site was live, we ran a training session for key board members, so they had full access to the back end of the site and were able to add future information in real time, and develop the website in line with the development of the organisation.